Produce elegant aesthetics for your home by choosing luxurious hardwood. 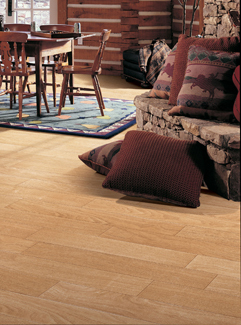 This classic flooring material has remained a favorite among homeowners for hundreds of years. The traditional beauty and proven durability of wood planks enable you to feel confident installing it in your home. By carrying one of largest selections of hardwood flooring in Twin Falls, ID, we are able to serve the unique flooring needs of countless local residents. With so many attractive and appealing wood floors to choose from, you are sure to find an option that fits your aesthetic preferences. To help you choose from the hundreds of options we have available, our showroom sales and design professionals provide you with assistance. Their job is to give you the information you need about different brands and features of flooring, as well as to assist you in choosing a style and color that complements your space. Let us show you the two main choices you have in wood floors—eco-friendly engineered hardwood flooring and solid wood. The one you choose should meet your lifestyle requirements and design preferences. Lifestyle considerations include whether you have a family and pets, the room you plan to install this flooring in, and your flooring budget. Design preferences refer to the species of wood you like best, as well as what you want in grain, finish, and gloss. Talk to our professionals about your decorating plans and they come up with solid recommendations on flooring that meets your needs. Engineered wood floors are improved in the manufacturing process. What they do is use a veneer of your favorite wood species as the surface layer and back it up with multiple layers of high-density fiberboard. The individual layers are bonded together to make a tough and long-lasting flooring surface. One of the biggest benefits of engineered hardwood is that this flooring resists moisture. Because of this, you can install this wood surface in any room of your house, including spaces that have high moisture content, such as the bathroom, kitchen, or basement. These planks do not expand or contract in reaction to humidity levels and offer home and business owners installation versatility. Make an investment you can be proud of by choosing solid hardwood flooring for your upcoming replacement project. Replacing outdated floors has the ability to produce noticeable results. Not only can you take interior designs to the next level, but you can even improve the market value of your home. Solid wood is a flooring classic for beautiful homes. This floor covering is meant to last for it can be refinished when the flooring looks worn and tired. In fact, solid wood planks can be refinished several times so that these floors last for up to 100 years. This is because you start with thick planks of solid wood that are milled from a single hardwood board. Solid wood is hardwood through and through. Choose the hardwood floors of your dreams that offer quality at fair price points. If you’re ready to start shopping for new and improved hardwood, you won’t need to sacrifice style for savings. Turn to us and take advantage of high-end wood services and selections at a price you can afford. Our hardwood floor prices are reasonable for homeowners with budgets of every size. By taking into account exactly what you are willing to pay, we are able to narrow down our selection to the options you can afford. Not only do we offer sensible rates on the collections we carry, but we also offer reasonable rates on hardwood flooring installation. Guarantee the long-lasting satisfaction of your new floors by investing in quality installation. Proper installation is essential to ensuring the performance and appearance of wood planks. This is why we back purchases made at our store and showroom with installation services performed by seasoned experts. Leave the installation to us and you can start enjoying updated hardwood sooner than you ever thought possible. The technicians entrusted with your hardwood floor installation utilize the most trusted techniques and tools to get the job done in a timely manner. We remain so confident in the installation team that we back their completed work with guarantees and warranties unparalleled by the competition. According to our Lifetime Installation Guarantee, if you experience any installation-related flooring problems, we’ll rectify the situation and cover all the expenses on flooring products that carry a four or five-star rating. Are you ready to learn more about the high-end selection of hardwood flooring available at our store and showroom? Contact us using the convenient form or by calling <PHONE> to discover the different styles we carry. Our service area includes Twin Falls, Mountain Home, Chalice, Sun Valley, Stanley, Idaho, and beyond.